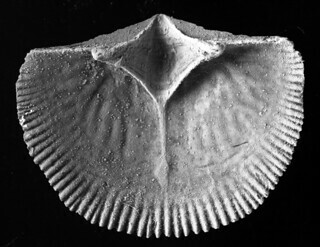 The Echinoblog: Because Brachiopods-that's why! 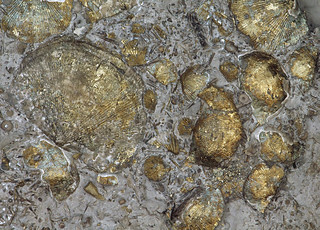 5 Things to know about Brachiopods! Because Brachiopods-that's why! 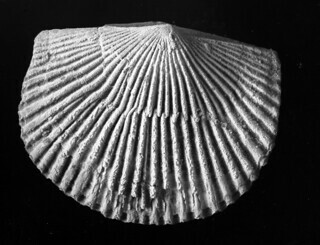 5 Things to know about Brachiopods! 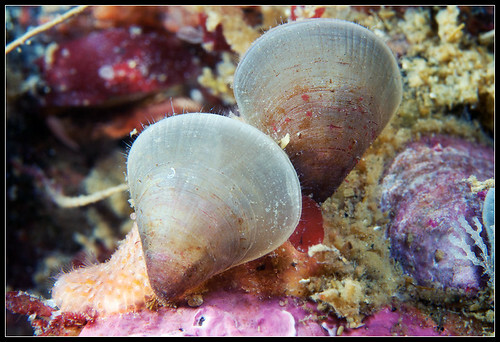 Brachiopods are actually a PHYLUM of animals. That's right a whole GROUP of animals that most folks have probably never heard of! Some places you learn about some new mammal, but HERE at the Echinoblog? you learn about a whole PHYLUM of animals in five easy steps! 1. What does the name mean? Brachiopoda, when you break it down: "brachio"= arm and "poda"= foot. Wha? The Arm foot? 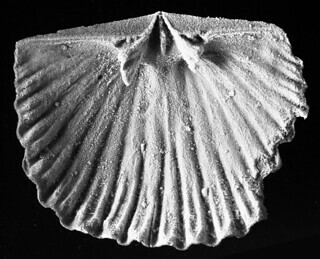 in the group informally known as the "articulate" brachiopods. Arm refers to the muscular arm-like aspect and "foot" to its use (or disuse) in attatching to the bottoms. 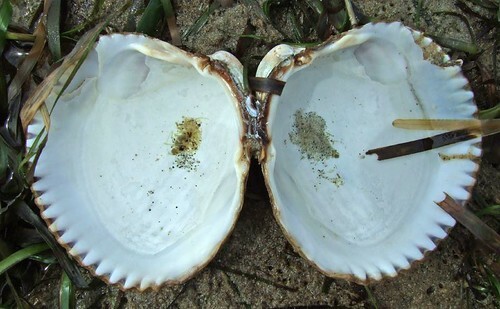 The pedicle manifests in two different ways relative to which of the two major groups of brachiopods you are looking at! 2. 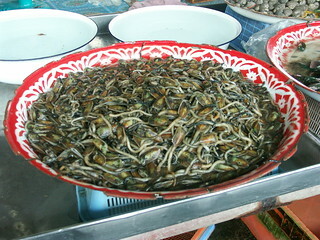 So these look like clams? What's the diff? 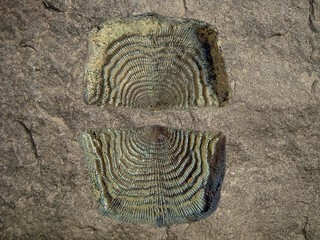 This image from Kristie Bradford's Historical Geology web page! 3. What/How do they eat? 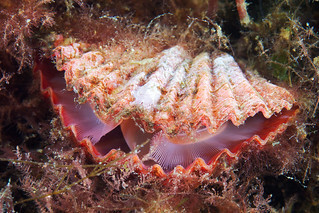 Brachiopods have a feathery feeding structure called a lophophore! 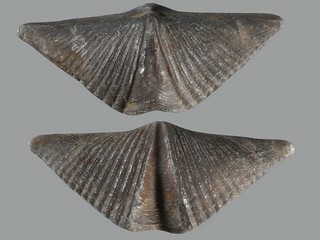 Brachiopods are basicaly suspension feeders. Water flows in and over the lophophore and tiny finger-like bits called cilia pick the food up! Here's some reality from the very talented Arthur Anker showing the lophophore with the animal's valves open! 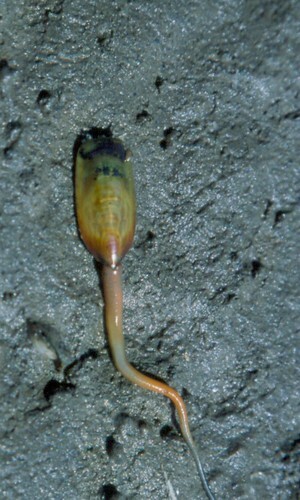 A further GREAT pic of the lophophore can be found here..
4. 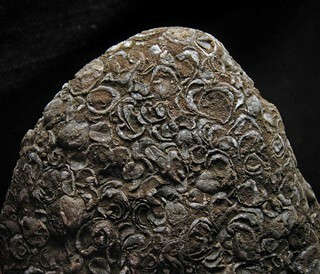 In the Paleozoic (roughly 250-500 million years ago), brachiopods were once THE happening invertebrate! 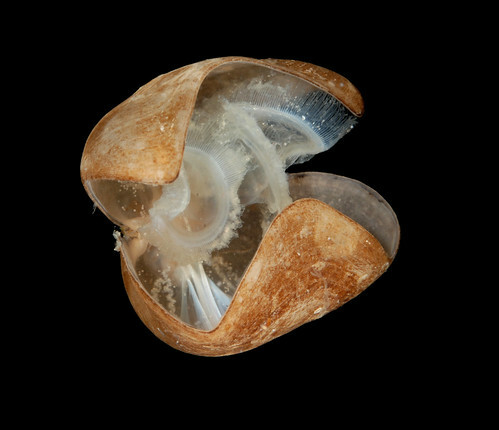 According to the World Brachiopod Database only about 385 species occur today from the ~30,000 described (mostly fossil) ones!! 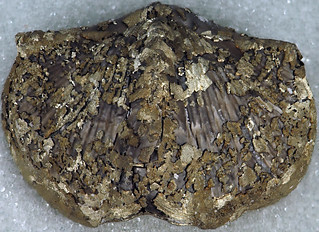 In the fossil record, the "shells" (called valves) of brachiopods sometimes undergo a process in which they are replaced with pyrite aka fool's gold! This makes them golden and sparkly! 5a! More Geology Fun! 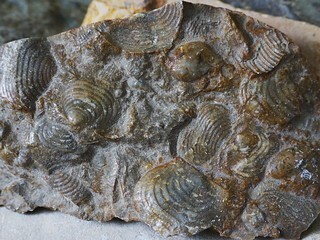 Brachiopod valves are often found in cross sections of rock! Geologists know the value of a good cross section! 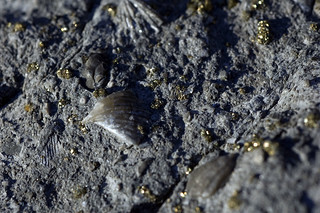 Brachiopods are VERY abundant in Paleozoic rock. And if you cut through the shells of one you get some pretty distinctive impressions in the rock.. 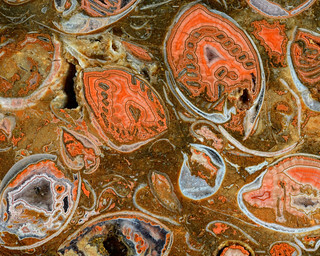 Sometimes there are minerals such as agate! 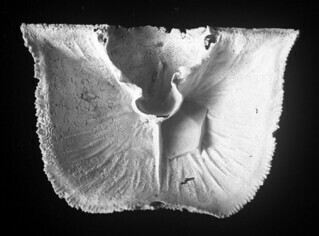 Brachiopod shells can be pretty dense and sometimes you see a lot of them! 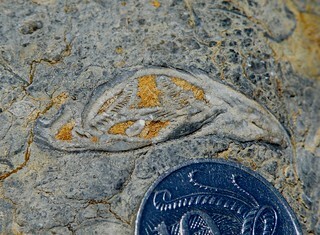 Sometimes you see some neat rare stuff.. like this soft-part preservation of a lophophore! FUN FACT! 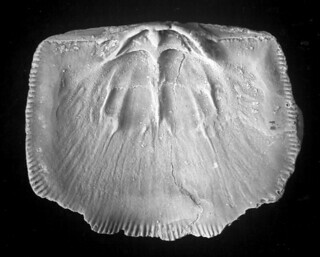 People EAT brachiopods! My name is Daniela and I am an undergraduate student at the Federal University of Minas Gerais (UFMG) in Brazil and I'm part of an academic monitoring program. It was proposed to the students who are part of the program to create a website about zoology.